There are many examples of famous gorillas and gorilla stories known by all people around the world. They are very common animals in popular culture, and almost everyone can mention at least one character, like King Kong, or those in the Planet of the Apes. In the imagination of many people, gorillas are strong, powerful and aggressive creatures that hit their chest angry, roar and show sharp canine teeth, and at the slightest provocation can rip your head off. In contrast with this stereotype popularized in films, series, cartoons and even video games, reality is another, because these primates show a peaceful behavior and only react with blows to his chest and roars to intimidate a predator and defend their troop from him. Just in 1902, the mountain gorilla was discovered. Scientific research about the genus Gorilla is relatively recent; in 1902 the mountain gorilla was found. Some believe that about 2,500 years ago, the crew of an expedition from Carthage came to the western coasts of Africa and discovered gorillas by accident, although it is not a confirmed fact that they saw these primates. It is possible that some time ago, gorillas were seen as primitive humans, and even some old scientific texts mistook them as individuals of a pygmy tribe. It was until early nineteenth century that people native from the areas where they live, such as the Democratic Republic of Congo and Gabon knew gorillas better. But among people outside Africa, they were almost mythological creatures, from which they had heard only stories. For example, in the sixteenth century, an English sailor was captured by the Portuguese in the west coast of Africa and claimed to see giant human-like apes. Thanks to research developed during the twentieth century, gorillas were no longer myths and joined the scientific field. But at the same time, they emerged in the media as fictional characters and acquired a place in the modern culture. 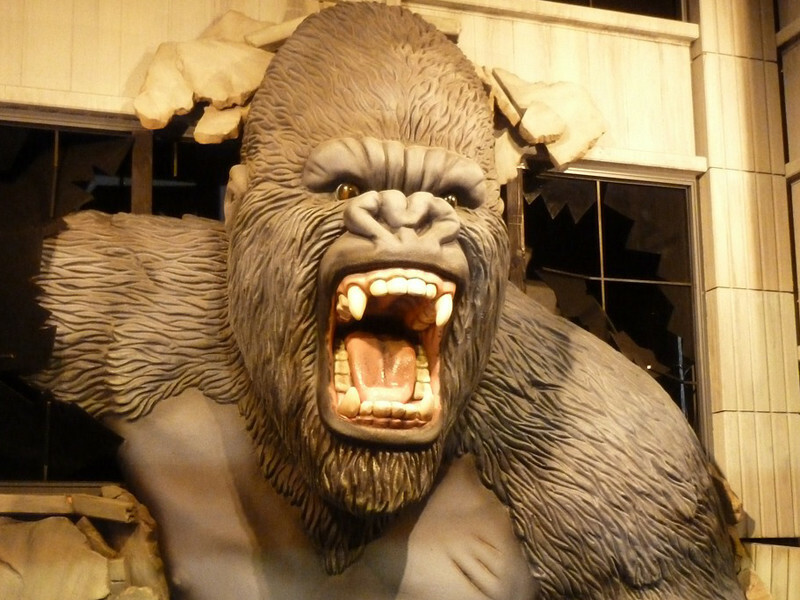 King Kong is the king of gorillas in Hollywood, and its presence extended to books, video games, comics, and cartoons. The original movie dates from 1933, and the famous protagonist is a giant gorilla who lives on an island with other large creatures. After facing a film crew and developing a fascination for an actress, is taken to the U.S. where is killed in the iconic Empire State Building. King Kong has appeared in books, video games, comics, and cartoons. In the book, Planet of the Apes (La Planète des singes, 1963), by Pierre Boulle, the society of a fictional planet is organized into three types of apes: chimpanzees, orangutans, and gorillas; the latter are the police, military, and hunters. A more recent movie starring a gorilla is Mighty Joe (Mighty Joe Young, 1998), a remake of a film from 1949, with the same name. It is the story of a gorilla that poachers killed his mother when he was very young, and his friendship with Jill, a young woman who lost her mother too in the same incident. Despite the intentions of some people to kill Joe, he is returned to its habitat with the help of Jill. Gorillas in the Mist (Gorillas in the Mist, 1988), has a prominent place. The film based on real events portrays the primatologist Dian Fossey during her research of mountain gorillas and her attempts to save them from poachers, even risking her life. It was a very successful film and received excellent reviews, and it was a valuable publicity to make people aware of the problems that mountain gorillas face. In cartoons, you might remember watching “The Great great ape” show (Hannah-Barbera, 1975-1978), where a big purple gorilla was the main character. In Latin American it was well known Magilla Gorilla, the central star of a television show with the same name, also from Hannah-Barbera. In this cartoon, the protagonist lives in the pet shop of a man who bought the gorilla to sell him, but throughout the series he is returned many times by the customers because he is always in trouble. The music industry has the virtual band Gorillaz, which took its name from these primates. There is another group called The Gorillas, formed in 1974 in England. Are you a gamer? It is possible that you already played Donkey Kong, a Nintendo character created in the early 1980s, which became a very popular Arcade game. Donkey Kong is a big gorilla that keeps captive a character that Mario must rescue. Fortunately, not only the fictitious gorillas have reached notoriety. Koko is a female gorilla famous because she learned to communicate with humans through American Sign Language, and for adopting kittens. Koko still lives in California, United States. You probably remember more examples of gorillas, because their presence in the media is usual.